AC Milan officially unveiled new signings Gonzalo Higuain and Mattia Caldara on Friday, but reports suggest that they could quickly move on to a new target. 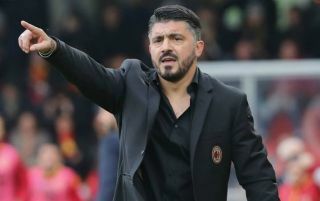 The Rossoneri missed out on Champions League qualification again last season despite a spirited effort after Gennaro Gattuso’s appointment in November. Naturally, they will hope that Higuain and Caldara will play a key role in strengthening their bid to land a top-four finish in Serie A in the upcoming campaign, but more is perhaps needed in order for them to compete on multiple fronts. Red and Black passion at #CasaMilan ??? Passione rossonera a Casa Milan ??? As seen last year, Milan fell short both domestically and in Europe with Gattuso forced into heavily relying on the same key individuals right through the campaign due to a lack of depth. One area that is arguably in need of strengthening is the midfield, with favoured trio Giacomo Bonaventura, Lucas Biglia and Franck Kessie playing heavy minutes. According to Calciomercato, Real Madrid ace Mateo Kovacic has emerged on their radar with the Croatian international said to be keen on a return to Italy after his previous spell at Inter. The 24-year-old has struggled to establish himself as a regular in the starting line-up at the Bernabeu since arriving in 2015, albeit making 109 appearances in all competitions. Nevertheless, with the likes of Luka Modric, Toni Kroos and Casemiro as competition, he may continue to struggle and so perhaps a move to Milan, who have big ambitions this season, could be an appealing option to regain a prominent role. Meanwhile, Calciomercato claim that Milan could be forced to balance their summer activity with the sales of two of Nikola Kalinic, Andre Silva and Carlos Bacca. Given Bacca was shipped out on loan last season, the Colombian forward would seem like an obvious candidate to go, provided a suitable bid comes in, while both Kalinic and Silva struggled for form last season. While the Portuguese ace is still 22 years of age and has room for growth, Kalinic, 30, had been expected to make an instant impact given his experience in Italy, and so perhaps his exit would also make sense for Milan with Higuain and Patrick Cutrone set to spearhead their attack this season.